I recently was put on the activities committee for the Relief Society (the women's organization at our church) and the first order of business was planning our Christmas party. I was really excited to be a part of this cause party planning is oh, so fun and the other women in our committee are really talented and great to work with (no stepping on toes or hurt feelings - just talented, good people!). 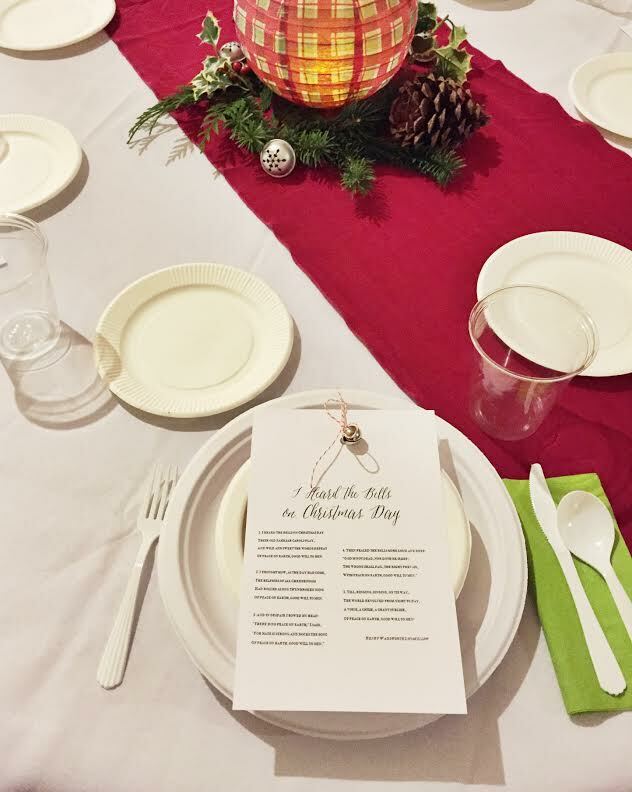 It turned out really nice and I wanted to share some of the things we did in case you're planning your own Christmas church party on a budget. We decided to have a dinner and then a short program with the theme of "Longfellow's Christmas: I Heard the Bells on Christmas Day." We set up a projector and a screen so we could show this wonderful video and we used the same sound system to listen to instrumental Christmas music during dinner, which was nice. 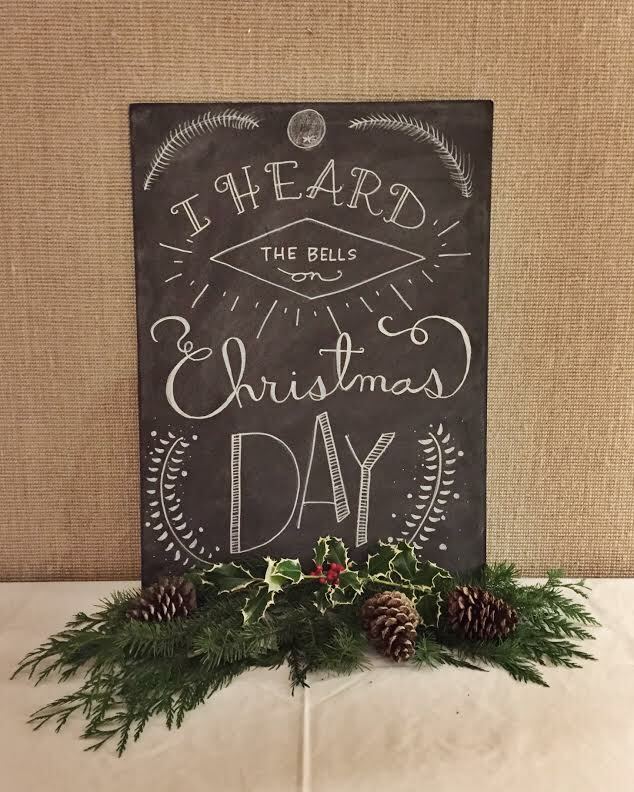 I printed out the lyrics to "I Heard the Bells on Christmas Day" and tied a tiny bell at the top with some baker's twine and put one at each place setting. Then, I printed out the story of Longfellow's Christmas and put it in an envelope under each plate to open when we began the video. I figured it would be nice for some of the "hard of hearing" women to be able to follow along and also for people to take home and read again - it's a wonderful story. We had a few left over as well, and will hand them out at church on Sunday to those who were unable to make it that night. 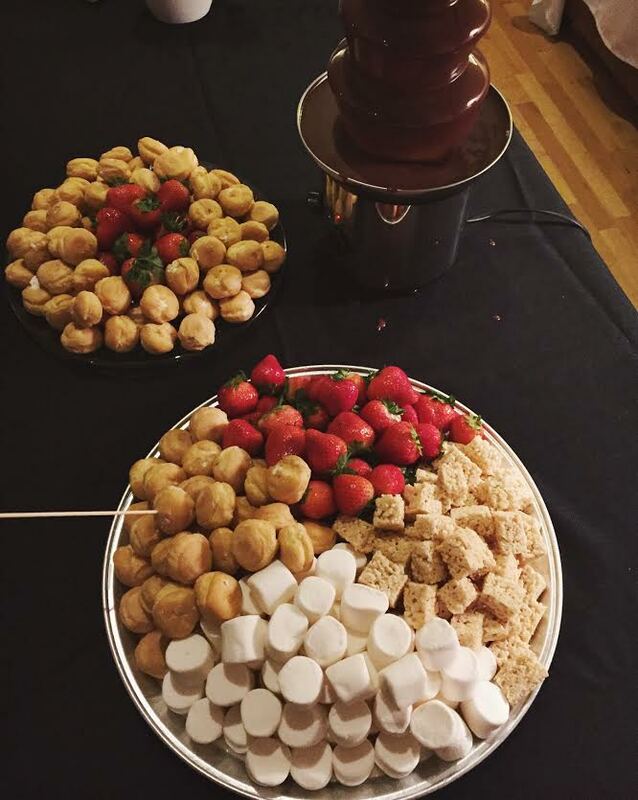 We served appetizers and then soup, salad and homemade rolls (quintessential "light supper" food) and one of the ladies on our committee had this chocolate fountain which everyone really had a good time enjoying with cream puffs, strawberries, marshmallows and rice krispie treats. After eating and talking for about an hour, we started the video and told everyone to open their envelopes so they could follow along. I love this story and the performance by Edward Herrmann. It is one of my favorite Christmas traditions to listen to. As for decorations, I had some red runners that have gotten a ton of use (thanks for those, Mom!) and I bought these $4 plaid lanterns from Target. We put some battery powered votive candles inside and then put some evergreen leaves around them and some bells. It was really inexpensive but it looked cute. The lights in the gym were so glaring so we didn't want to turn them on, but the votives didn't give off enough light so we brought in a bunch of floor lamps and table lamps from home and placed them around the gym. It was just the right amount of soft light. Looks like a wonderful evening. Will you post what was in the envelope so we can have a copy? Already thinking about this for next year's RS fun! 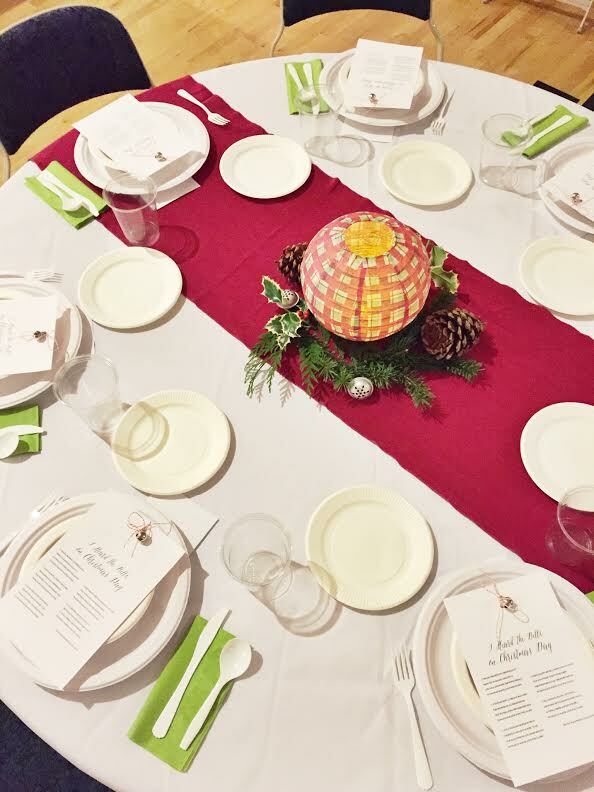 This is a wonderful post on relief society Christmas party!! Every year I celebrate Christmas with my parents in NYC and attend lots of Christmas NYC events. But last year I couldn’t be with them due to some personal issues. I am feeling sad for that! !